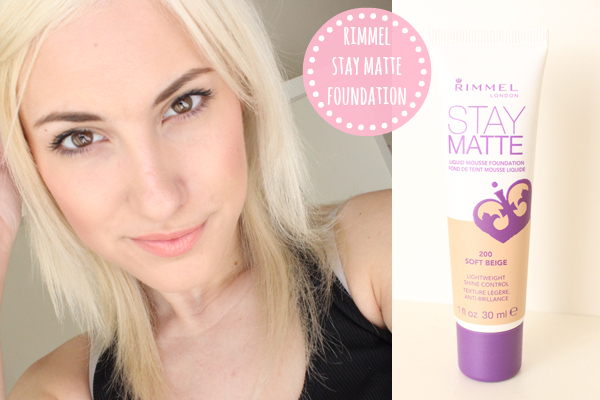 Brand new product from Rimmel London is the Stay Matte Foundation that says to be feather-light, liquid mousse blends flawlessly for natural-looking, all day shine control. Silky smooth formula leaves a perfectly matte, baby-soft finish. Lightweight texture won't feel heavy or greasy. With That they even said it to be "Shine Control" which was very interesting as I do have an oily T-Zone. I was luckily enough to be able to test the product out before they ht stores in September. The colour I chose was 200 Soft Beige which is part of their medium colour range. The colour matched my skin perfectly, as with a little tan that I had from Malta I thought going for a lighter shade would be a No No. It is a mousse Foundation and straight away reminded me of the Maybelline Mousse foundation I used to adore back in my teenage years. It sets Matte as it states and no Powder is needed at all. You have to work the foundation into the skin and it doesn't look cakey at all. Overall, I would say this has a light-medium coverage and blends in nicely into the skin. I would recommend this foundation to those who love that matte face with no shine and who prefer a natural look to a more full coverage face. The Product will retail for £7.99 and hit stores in September. WILL YOU BE PICKING UP THIS FOUNDATION ONCE IT HITS THE STORES? DO YOU LIKE MATTE FOUNDATIONS? Great post! I will keep a look out for this as I'm currently in need of a lightweight foundation. I think I'll try this for uni and see how it goes :) coz sometimes I need some coverage during school days but I don't like those heavy foundations for everyday basis.